Le jour où je sentirai mon pied faiblir sur le tréteau, le jour où la voix me manquera, où je ferai définitivement retraite entre ces trois collines d’où la vue s’étend jusqu’au Jura, je voudrais qu’à ce moment là quelque chose de moi continuât de courir le monde, quelque chose de plus robuste, de plus jeune et de plus grand que moi, dont il me fût permis de dire: c’est pour cela que j’ai travaillé. C.Dullin, J. Copeau, A. Tollier, B. Albane, G. Roche, J. Lory, S. Bing, L. Jouvet, R. Carl, A. Karifa et Filou le chien. 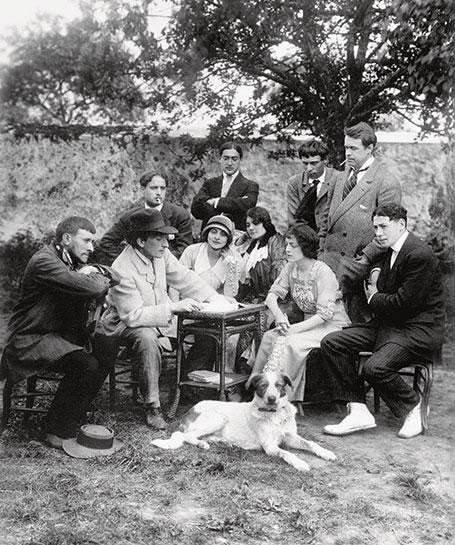 1919, return of the United States: Jacques Copeau surrounded by Valentine Tessier, Blanche Albane, Paul Oettly, Jean Le Goff, in the courtyard of the Vieux Colombier. 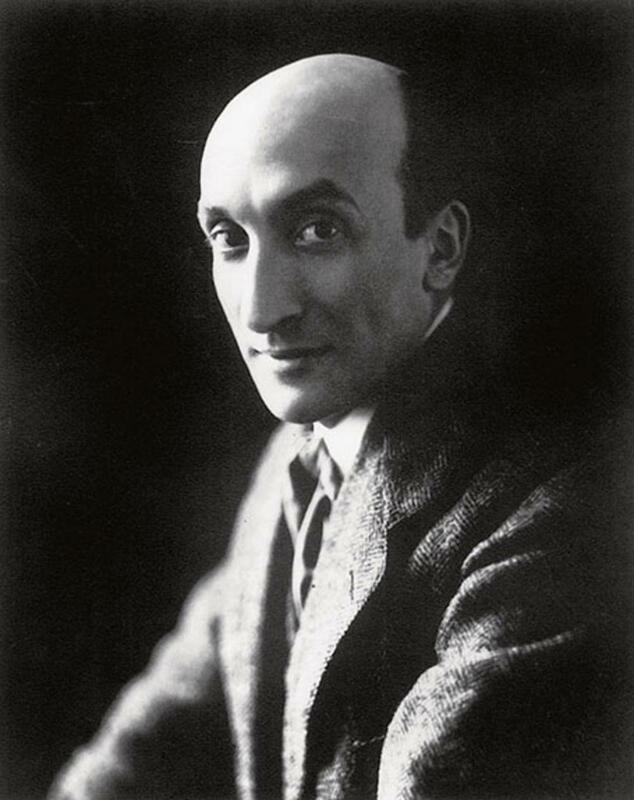 1879 – February 4th : Birth in Paris, Faubourg Saint-Denis. 1887-1896 Secondary education at the Lycée Condorcet, Paris. 1902-1903 Lives in Denmark, where he marries Agnès Thomsen. 1903-1905 Beginning of a friendship with André Gide, Jean Schlumberger, Henri Ghéon. Works at the Galerie Georges-Petit and for several journals as a theatre critic. 1907 Succeeds Léon Blum as theatre critic for La Grande Revue. 1908 Founds the Nouvelle Revue Française with Gide, Ghéon, Schlumberger and André Ruyters. 1911 – April : First performance at the Théâtre des Arts : The Brothers Karamazov, based on Dostoyevsky’s novel, written with Jean Croué, staged by Arsène Durec. Copeau meets Charles Dullin and Louis Jouvet. 1913 – October 23rd : Founds the Théâtre du Vieux-Colombier in Paris. 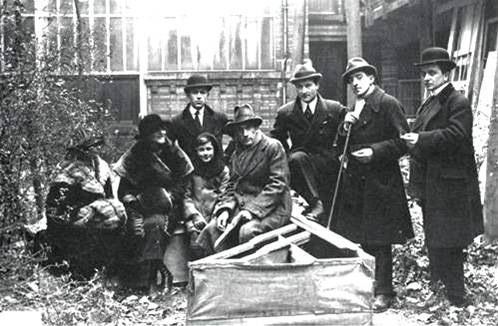 1915 Meets Edward Gordon Craig in Florence, Adolphe Appia and Emile Jaques-Dalcroze in Geneva. November Establishes educational workshops with children of Paris alongside Suzanne Bing. 1917-1919 The Vieux-Colombier company settles in the United-States: two seasons at the Garrick Theatre in New York, where Louis Jouvet stages a new theatrical set-up. 1920 – February : Reopening of the Vieux-Colombier, provided with the fixed set-up conceived with Jouvet. Mars Suzanne Bing opens diction and drama courses. 1921 – November : Official opening of the Vieux-Colombier School. 1924 – May : Presentation of the exercises of the School and of Kantan, by Zeami, staged by Suzanne Bing. Closure of the Theatre. September Creation of a theatre community in Burgundy, in Morteuil, which gathers most of the School’s students. The Burgundian farmers name them ‘the Copiaus’. 1925 The Copiaus settle in Pernand-Vergelessess, in Côte-d’Or. Return to Catholic religion. 1927 Copeau stays in the United-States. The Copiaus go on tour in France, Belgium and the Netherlands. 1928 The Copiaus go on tour in Italy. 1929 – May : Dissolution of the Copiaus. Press campaign for Copeau’s nomination as the administrator of the Comédie-Française. Copeau starts writing Le Petit pauvre, a play about St. Francis of Assisi. 1931 Publication of the Souvenirs du Vieux-Colombier. 1933 – May : Stages Le Mystère de Santa Uliva in the cloister of Santa-Croce, in Florence. 1935 – May : Stages Savonarole on the Piazza della Signoria, in Florence. 1936 Appointed ‘‘staging technical advisor’’ at the Comédie-Française by the Popular Front government, with Charles Dullin, Louis Jouvet and Gaston Baty, under the administration of Edouard Bourdet. 1940 – May : Appointed administrator ad interim of the Comédie-Française, as a replacement for Edouard Bourdet, who is hurt. Under the pressure of the German occupiers, he accepts the resignations of the Jewish comedians. 1941 – January : Confirmed in his post by the Vichy government, he is ousted of the Comédie-Française under the pressure of the German occupiers. 1943 Stages Le Miracle du Pain Doré in the yard of the Hospices de Beaune. 1944 Publication of Le Petit Pauvre. 1949 – October 10th : Copeau dies at the Hospices de Beaune. Chronology established by Marco Consolini and Raphaëlle Doyon, from ‘‘Jacques Copeau’’, Nouveaux Cahiers de la Comédie-Française, October 2014.